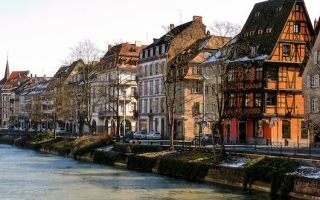 The largest city in the Grand Est region of France, Strasbourg sits on the banks of the Rhine River adjacent to Germany. It’s one of the largest medieval quarters in Europe, known for its cobblestone streets, gothic cathedrals, and timber framed houses along the canals. Today, it remains a culturally fascinating city where French and German influences blend. Running in Strasbourg is a great way to explore this small, yet complex city. The old town streets are narrow and somewhat uneven, but many are closed to traffic which makes more open space for your workout. Try the Old Town run for a quick historic tour of Strasbourg’s top sites. There are also numerous paths (‘quais’) along Strasbourg’s canals and rivers. 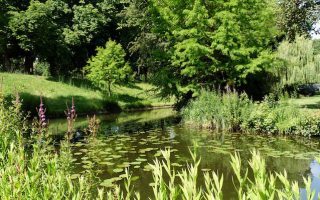 For a classic European canal run, the lovely paths along the Bruche Canal go for 28 km. 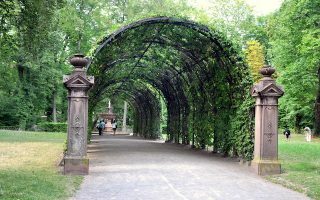 Around l’Orangerie, try the quai paths, and the beautiful park. We’ve also put together a great Park Run, incuding the Parc de l’Orangerie, Botanical Garden, Contades, and Parc de la Citadelle. Run in along the water in two countries and over a neat bridge in our Jardin des Deux Rives run. Pourtalès Park and chateau, a few km northeast of the center, is a great running spot. Strasbourg is a small city, so getting around on foot is simple. However, public transportation is easy and extensive. Tram and bus routes circle the city, hitting most of the major neighborhoods and destinations (even the far off towns along the Bruche Canal) so run as far as you like! A 'runseeing' tour of Old Strasbourg. Follow this route over cobblestone streets, bridges, and architecturally significant plazas. 3 km (1.8 miles) total. This is a straightforward, ‘square’ loop of some of Strasbourg’s ‘Quais’, which are paths along the canals and the Bassin des Ramparts. The paths skirt the perimeter of the Parc de l’Orangerie and other parks and gardens. 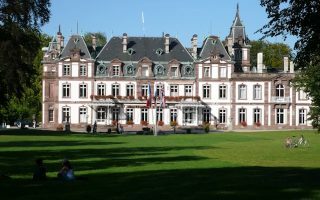 A gorgeous and multi-varied run incorporating Strasbourg's major parks and gardens, some canal paths, and a jaunt up to the European Parliament. Includes Parc de l'Orangerie, Botanical Gardens, Parc de la Citadelle, Parc Contades, Tivoli Square. The scenic green space surrounding Strasbourg’s historic citadel is not the longest run in the city, but it’s a good quick option from the University or the Esplanade neighborhood. This canal towpath turned tarmac bike path runs for 28 km along the water with gorgeous views of greenery and farmland. Run as far as you like and turn around. Also possible to run one way and catch a bus back. The Jardin des Deux Rives, or Two Shores Garden, spans over the Rhine River from Strasbourg, France to Kehl, Germany. Our route between the two countries is about 6 km (3.7 miles). About 5 northeast of Strasbourg, there are lovely paths behind the Château de Pourtalès, a gorgeous 18th-century mansion. One can put together about 3 miles exploring the woodsy paths and shady lawns of the Parc de Pourtalès. 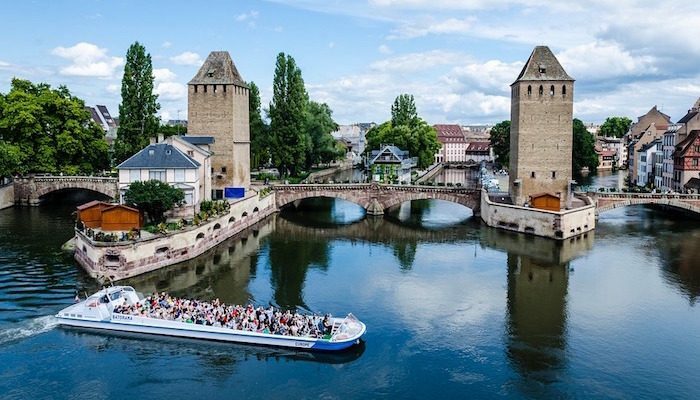 Explore the city’s modern evolution with this 6 km (3.8 mile) route through the European Quarter of northwest Strasbourg. 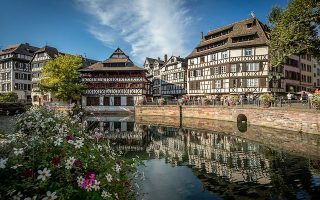 Strasbourg has an oceanic climate with warm, sunny summers and cool, overcast winters — good for wine growing! Average summer high temperatures are in the mid to high 70s (25C), although nights can get cool-ish. In winter, average high temperatures are in the low 40s (4C), with lows dipping just below freezing. Snow is occasional. You might need to be wary of snow and ice in winter, and pack cold weather running clothing. Precipitation averages 26 inches (665mm) annually, with spring-summer months averaging 2x winter months. due to thunderstorms/downpours. 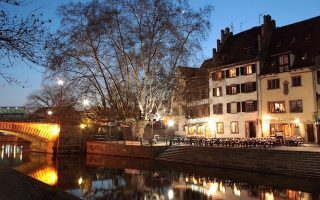 Strasbourg is a popular tourist spot, so there is a good range of hotels. 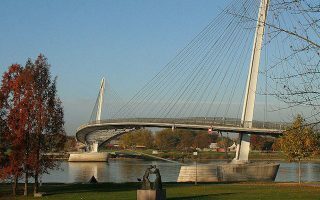 From a running perspective, we recommend staying within some proximity of the Old Town, to the west of the Rhine/German border, and inside the main roads that ring the city: the A4 to the west, Ave. des Voges to the north, and the E52 to the south. That way you’ll always be within a 1-2 km of our great routes! 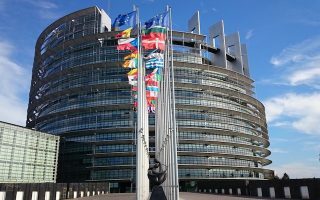 Learn more about visiting Strasbourg at france.fr. There are several great stores for runners in Strasbourg. The Endurance Shop is a general sports store and has great running gear. Jog’r is a dedicated running/triathlon shop. There are also outlets for Adidas. Other more general purpose sporting goods/outdoor gear stores carry running gear. See the map on the city home page for more info. Find the Strasbourg Marathon and other Alsace running events here.